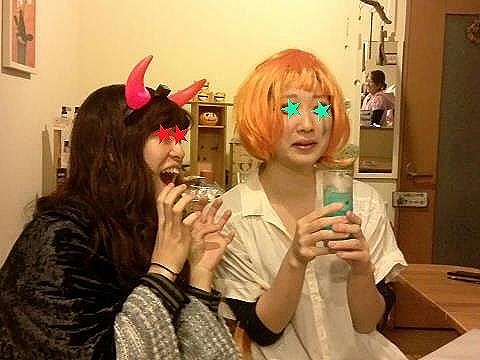 I was surprised at a sudden announcement about a Halloween party. 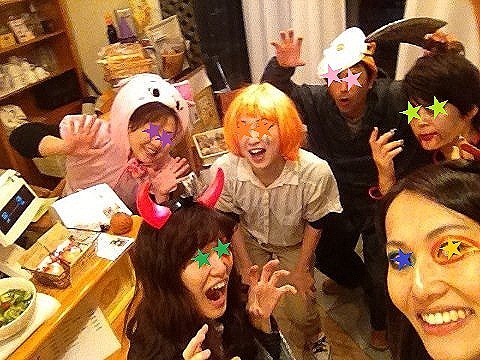 I found the info at facebook on the night before that Mairo was having a Halloween party on October 26. 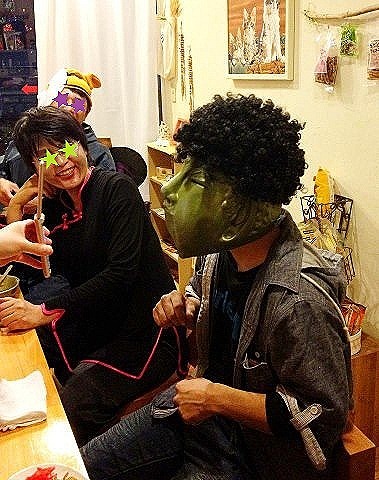 Mairo is a tiny bakery near my apartment and it sometimes holds interesting events such as Halloween parties. But I didn’t think they would have a Halloween party this year because I knew the baker was expecting and she was having a tough time in the early months of pregnancy. 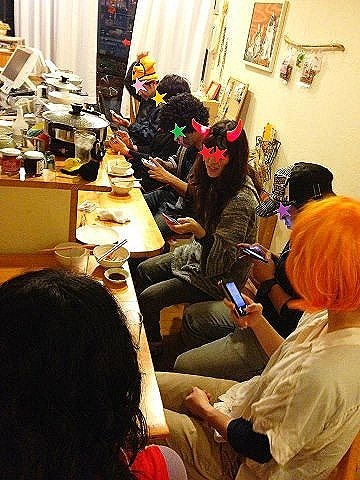 So, I sent messages to my friends to take part in the party together right away. Actually it takes much time to decide on what to wear or/and to become, and to prepare costumes for joining a Halloween party not only for me but also others. I always make my own costumes, but I did not have that time this year. That is why I decided to become a zombie this time because I did not need to prepare an elaborate costume. It is just a 20-minute walk from my apartment to the baker. But I did not think I should walk for the party. You know, I was wearing a terrible zombie make-up…blacken and bloodied face and sunken eyes…I did not want to scare someone on a dark street at night…What if someone would have a heart attack because of my appearance? So, I asked a friend of mine to pick me up. I prayed not to meet anyone but the friend before getting to the bread shop when I left my apartment. I pressed the elevator button and waited it. It came up and the door opened. I was relieved to see no one there. When I got into the elevator, it started going down. I hope I won’t see anyone…The door opened on the first floor and a woman was about to get it in, and then she gasped at the sight of me. 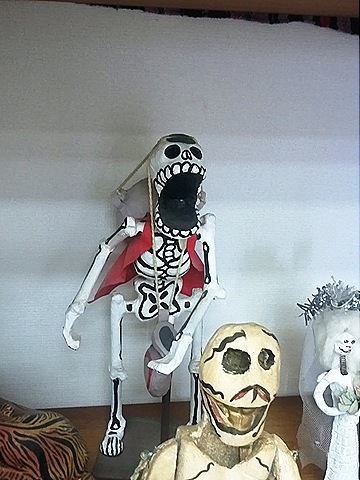 “Ah…good evening…” I said that and got off the elevator quickly…Halloween has become very popular in Japan as well but many people, especially senior citizens, don’t have a clue about it even now. When we entered the shop, the expectant baker, her sister, a new baker, and a woman welcomed us jubilantly. “Wow! What a scary! Thank you for coming!” Actually, Mairo, the bakery, changes to a tavern on Friday night. So, the last woman is the tavern’s shop master. 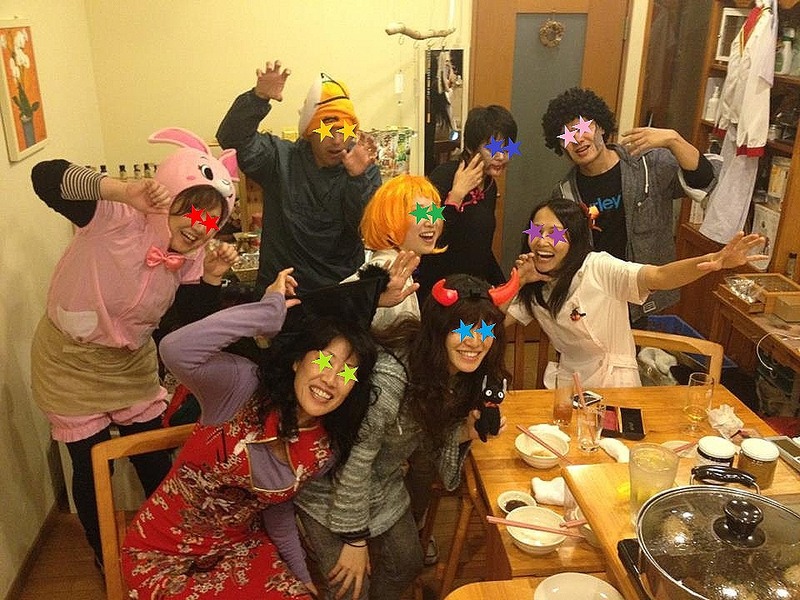 The participants in the Halloween party bought their drinks and foods at the bar counter. 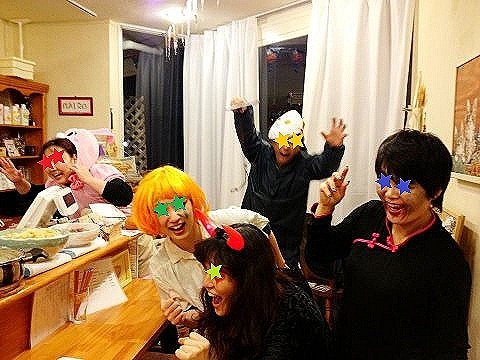 We hoped someone came to the tavern without knowing about the Halloween party because we wanted to surprise them with our scary-looking make-ups and costumes. But only party-goers showed up at that time. Of course, we enjoyed ourselves having delicious foods and drinks and chatting. We also enjoyed taking photos , posting them on facebook, and then checking them with our own cellphones right away. What an era! 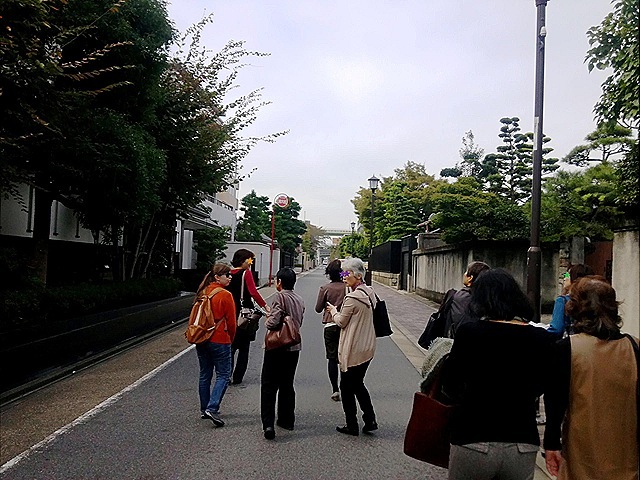 The Tour of Bunka-no-michi (The Cultural Path) in Nagoya: Let’s find out some histrical things in our town! 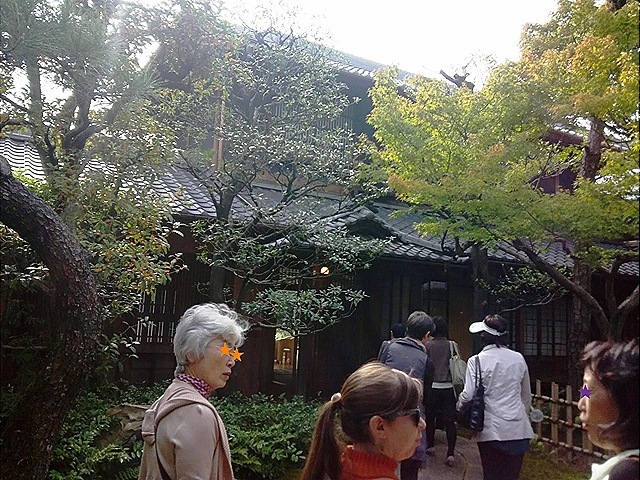 There is a historical area called “Bunka-no-michi”, or a “cultural path”, in Nagoya. It is located from Nagoya Castle to the Tokugawa Art Museum and has lots of old buildings. This district used to be a town in which middle and lower-class samurai warriors lived in the Edo period, and then flourished as a central place for society gathering entrepreneurs, journalists, and artists from the Meiji to the beginning of the Showa era. I had an opportunity to take part in a walking tour around the historically interesting area on October 25. 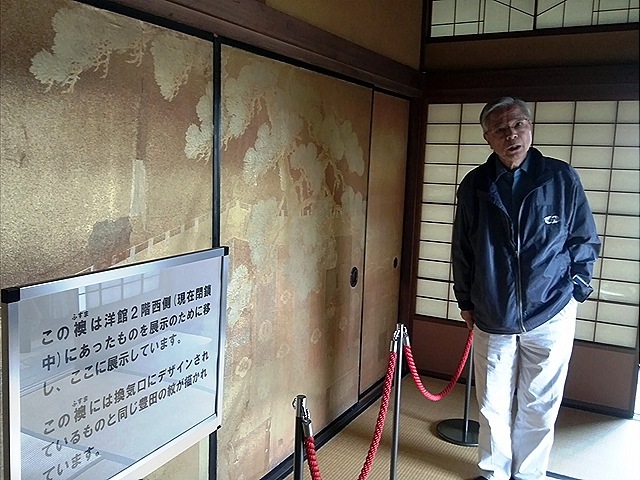 First, the tour participants visited Futaba Palace, which used to be a residence of Sadayakko Kawakami and Momosuke Fukuzawa. Actually, the original house had been located in another place. 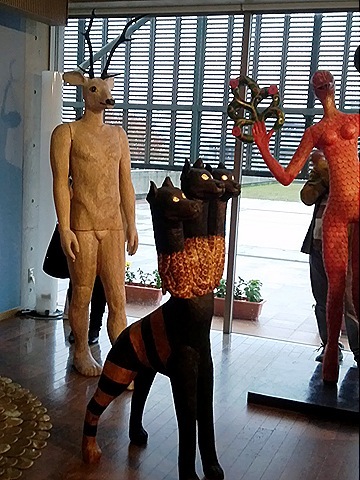 It was moved to the present place and was reborn as a museum in 2005. 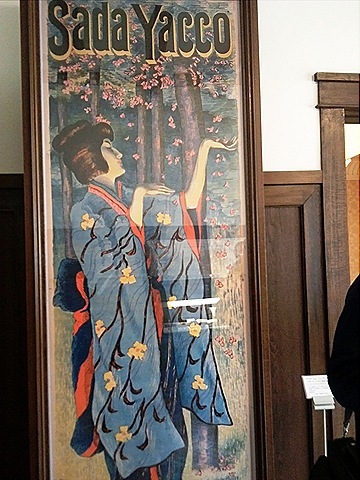 Sadayakko was the first Japanese actress, and her partner Momosuke was an entrepreneur launching an electric power business in the Meiji period and was called “King of Electric Power.” The museum exhibits not only Sadayakko’s costumes and possessions but also the Meiji era’s new technology and modern design such as stained glasses. You can see an interesting contrast between Japanese traditional lifestyle and the period’s modern European architecture at the same time. 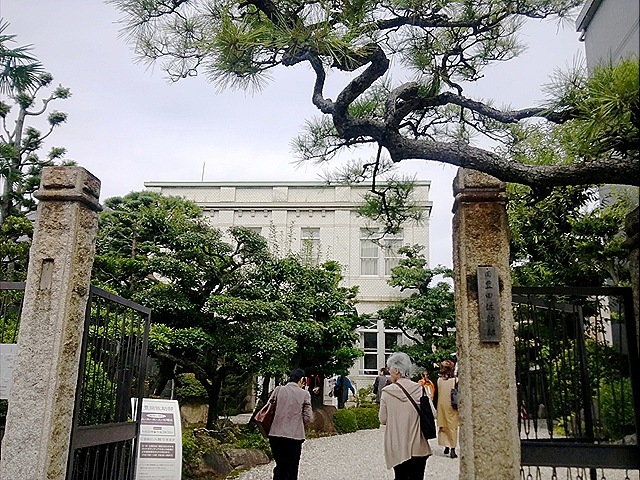 Second, we headed for the former residence of Sasuke Toyoda, one of whose brothers is the founder of Toyota Industries and is well known as the inventor of an automatic weaving machine, Sakichi Toyoda. Sasuke helped Sakichi with his brother’s business. 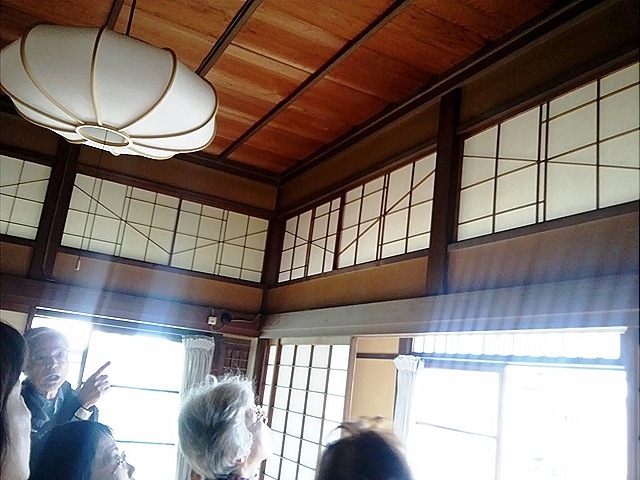 The building was built 90 years ago in the Taisho era. Sasuke’s other brothers’ houses also used to be in the same area, but today only his house is still there. By the way, did you notice that their family name is Toyoda but most of their companies’ names use Toyota such as Toyota Motors? It seems that they changed their companies’ names to Toyota because of appealing those companies were no longer their family business and of hoping their enterprises’ great success all over the world. Let’s go back to Sasuke’s house. It contains both Japanese and Western styles consisting of a wooden Japanese building and a white tiled Western residence. You will find many their family emblems here and there in the Western building. In this mark the Toyoda’s family name is hidden. Toyoda is written in Japanese hiragana character and those letters express two auspicious animals: a crane and a turtle. Cranes and turtles are representative longevity in Japan. In their Japanese rooms, you will find some delicate decorations, for example, elaborate fanlights and pulls of paper sliding doors. 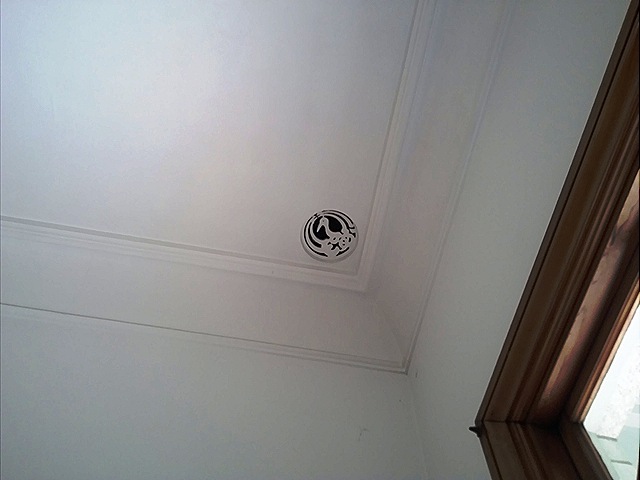 The pulls are different in each room and inlaid with shells. Besides, some of the paper sliding doors are actually a landscape painting. A guide explained about those things passionately. 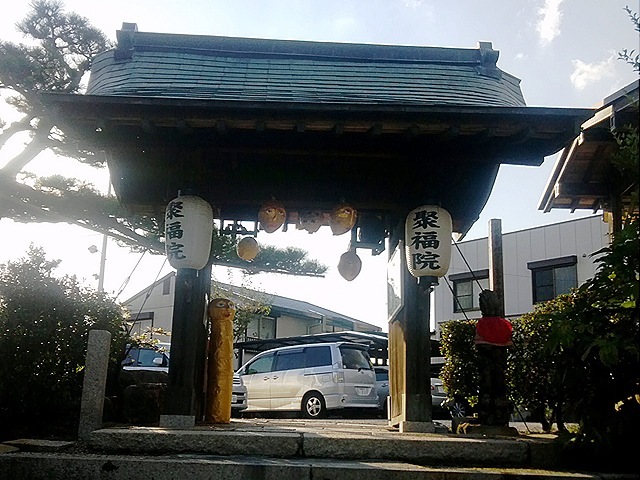 Finally, we went to Hyakka-Hyakuso. This place used to be a house of the Okaya family, the founder of Okaya Cooperation, which is a steel company, but now is open for public as a kind of rest house in “Bunka-no-michi”. I was really surprised at the gap between its Japanese traditional exterior appearance and its modern interior. 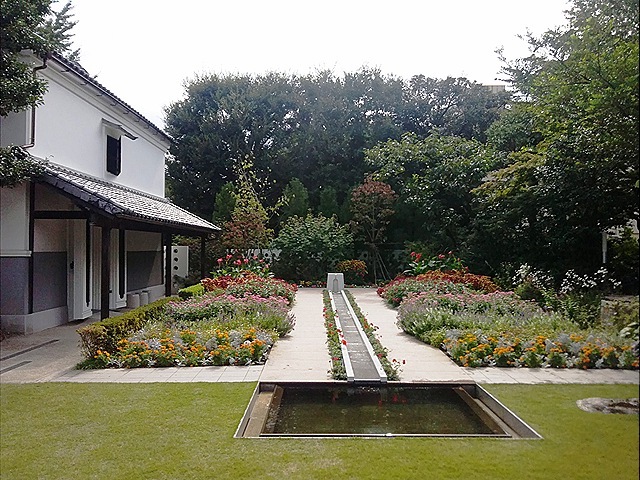 The contrast of their old storehouse and the Western style garden is also interesting. 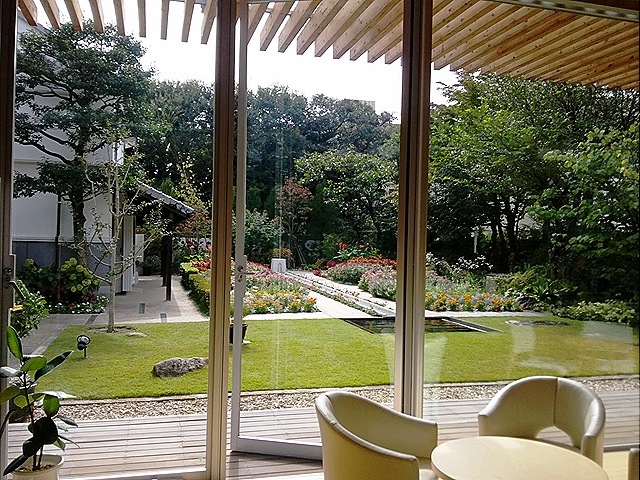 To be honest, I would rather they should have remain as a Japanese old house, though…Yet, the room and the garden are really beautiful, and you can enjoy live piano music there. 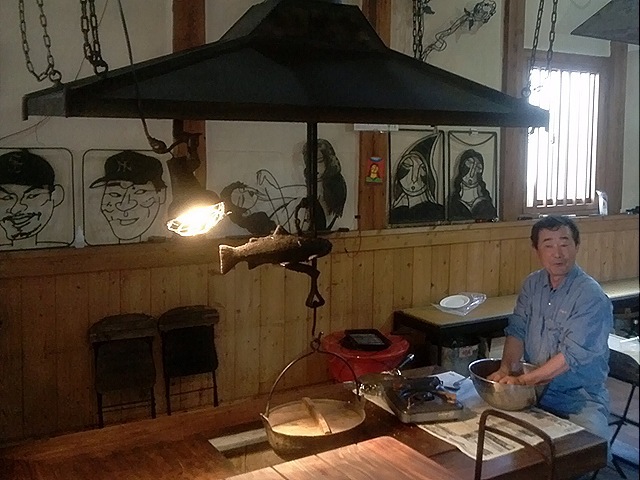 There are many interesting places preserving traditional Japan in “Bunka-no-michi” in Higashi-ku. Why don’t you walk around and try to find something Japanese in the district if you have an opportunity to visit Nagoya? Bunka-no-ie is a multipurpose hall in Nagakute. 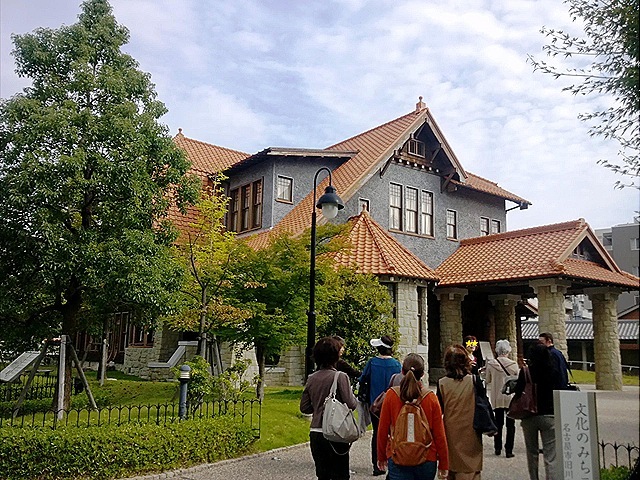 It has some exhibition rooms, a concert hall, music studios, students’ study space, Japanese room, etc. 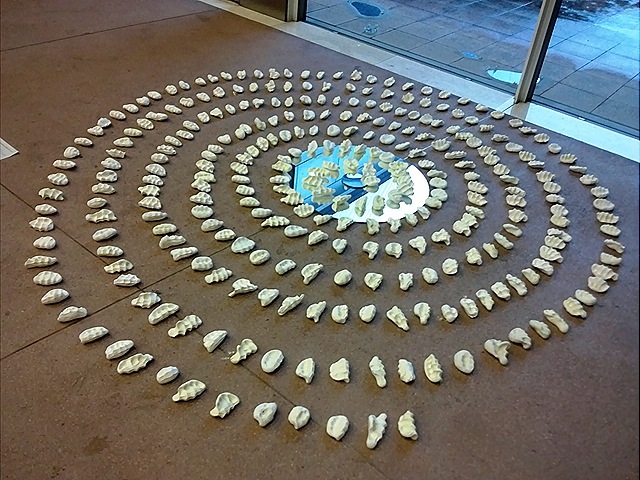 An art exhibition was held at the whole building during the period of the event. I decided to join the tour and followed the young people. They were exhibitors. 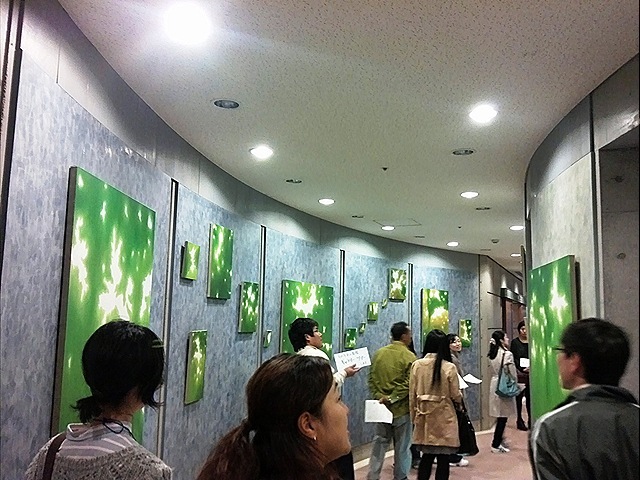 They explained not only their own works but also other presented works. 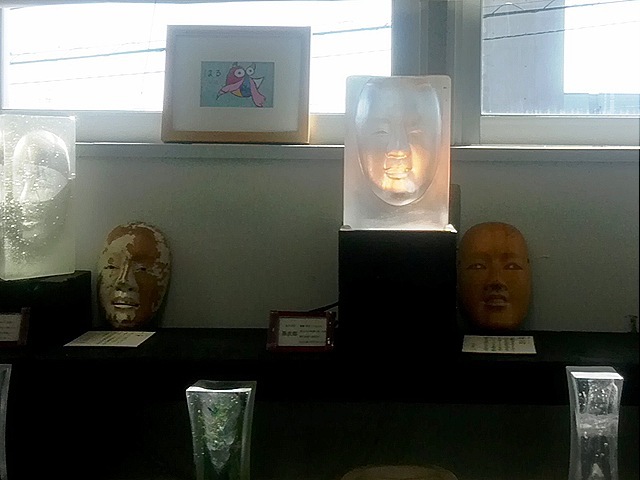 At Yuko Nakatani’s place, the participants joined one of her works. We were given a lump of clay, and gave it a squeeze. Then she placed it into her work at random. She believes that he squeezed clays are energized by the people and that the art work needs the invisible power for completion. 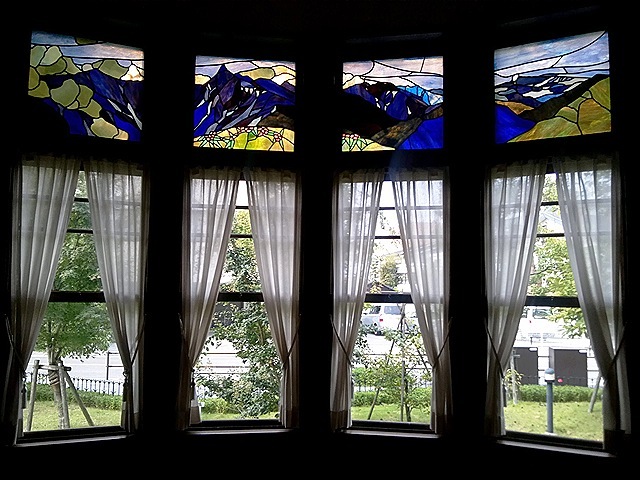 She not only exhibited some her paintings and objects but kept drawing on the window of the building during the period. Look at this photo: a girl and something white. Actually the white thing is her shell. First she took a cast of her whole body. Second she made a plaster figure of herself by the mold. Third she made a pattern. Finally she made herself with the pattern like sewing a dress. 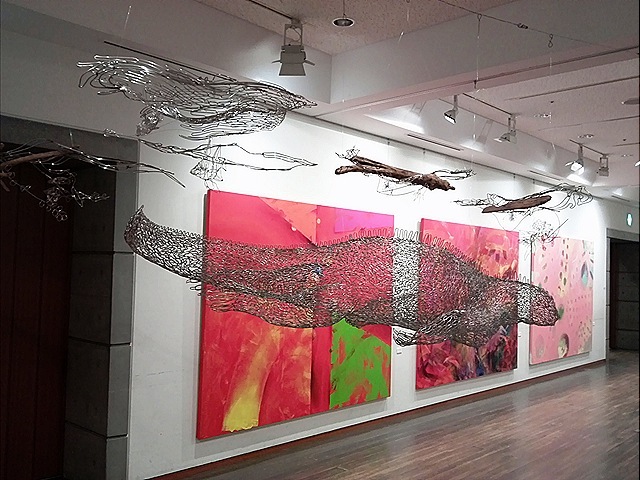 Hmm…it is difficult to understand contemporary art…But it is fun! These mysterious creatures were created by Roko Shirohzu. One of the guides told me that she is a wife of a Buddhist priest and their temple in Toyota is filled with her works…Oh, I’d love to visit the temple once! 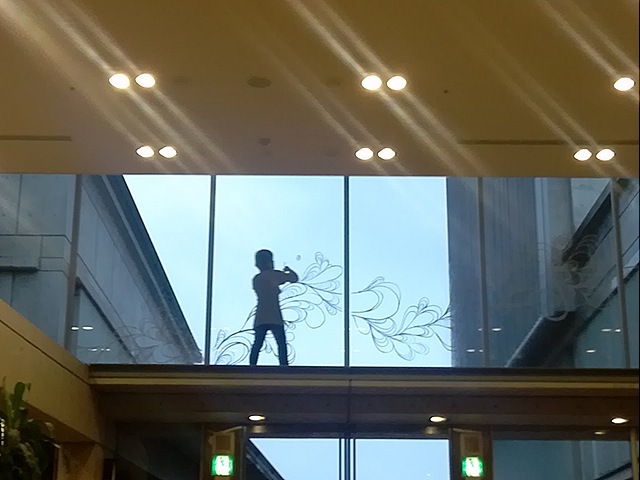 There were so many art works at Bunka-no-ie. I enjoyed myself seeing many beautiful and/or interesting works and talking to some artists there. In Japan people say, “Autumn is the best season for art.” Why don’t you go to art museums or paint or create something this fall? Nagakute Art Festival 2012 #1: Let’s make the town more lively with art! There’s a town called Nagakute next to Nagoya in Aichi Prefecture. Some of you might recall the name if I say that Aichi Expo was held there in 2005. They have an interesting event called “Nagakute Art Festival” every year, and you can see many art works in 30 sites during the period. It was held from October 20 to November 4 this year. I went to see some on October 20 and 28. I’m going to write about it in twice. Next I went to Tane-An. The building is more than 400 years old. It used to stand by the Horikawa River as a wholesale depot, but it was relocated in Nagakute about 80 years ago as a storehouse and now is used as an art gallery. The owner is Mr. Taneatsu Takeda. He runs an iron factory. He has become an iron art craft worker through his job. 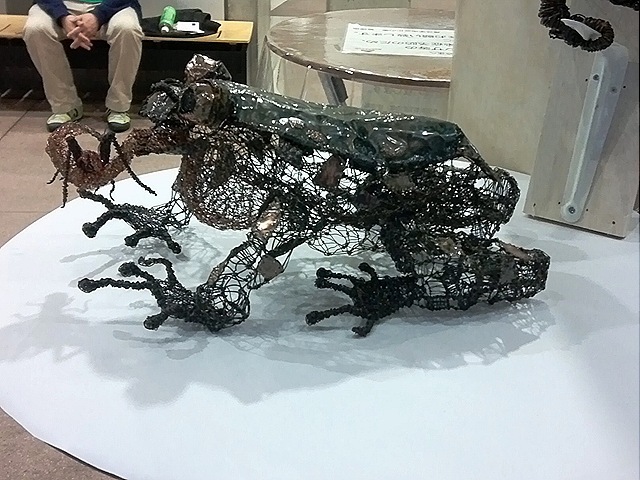 The strong and hard material shows its soft character after it became an art by Mr. Takeda’s hands. All of his works look humorous. It must reflect the artist’s personality. Recently he has been interested in pesticide-free production and grown rice and vegetable by himself. He gave me some dumplings made from his rice when I visited. I thought I was lost. After leaving Tane-An, I headed for Takayoshi Mexico Art Museum. Is really there a museum around here? I was in an industrial area. Yes, it was there! I was very surprised to see the museum appear suddenly at the dead end of the narrow path. 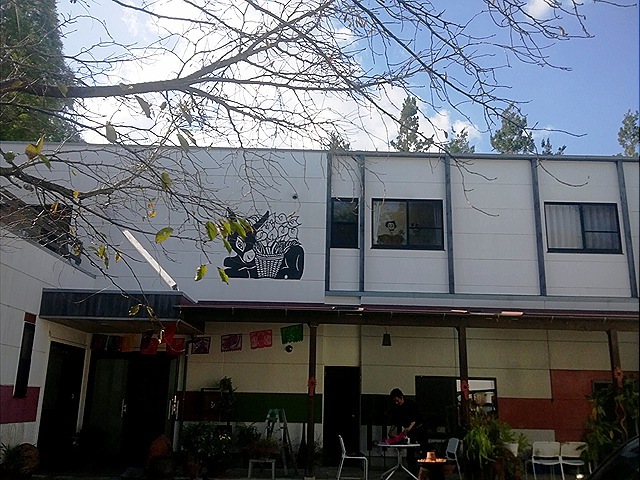 According to the owner, there is a holiday called Day of the Dead in Mexico in November. That is why there were many exhibits related to death in the museum when I visited. 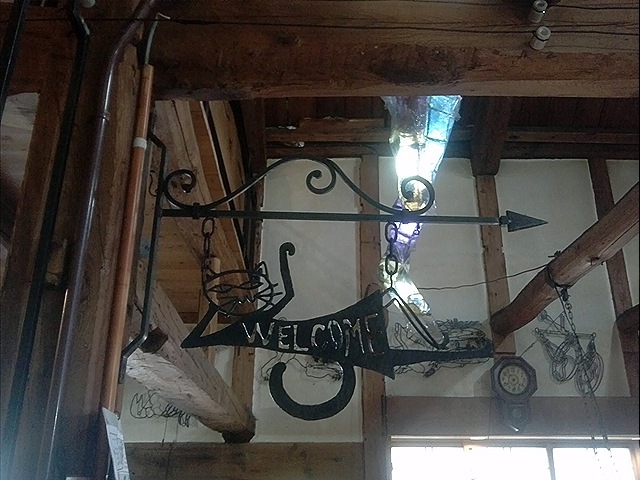 The owner runs not only the museum but also an art craft company, where they make ceramics, glass things, and wooden items. He and his family kindly showed me around their factory as well. Their dog Rocky also welcomed me. 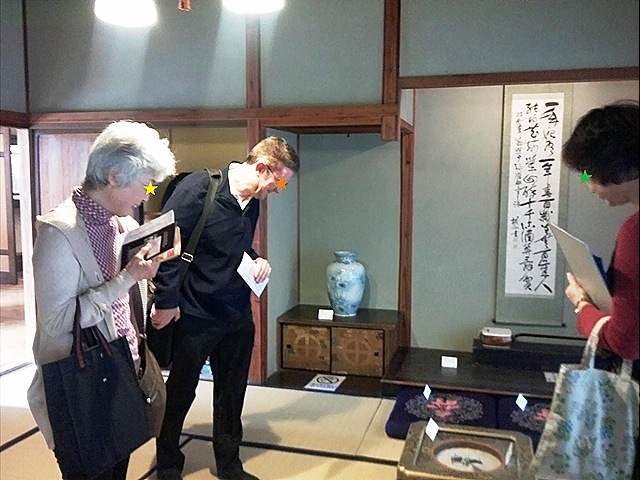 Next I went to see wears and ornaments made from old kimono. 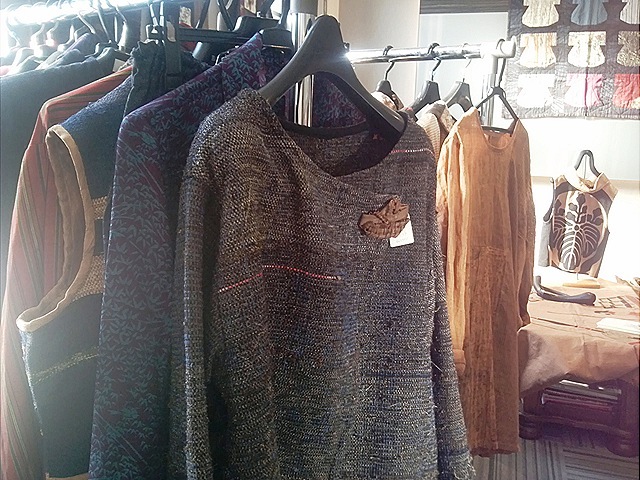 The artist rips materials and then weaves with them, or uses some parts of kimonos and makes new things with them. I could not take the artist’s picture because she was very shy. Finally I went to a temple: Jufuku-In. 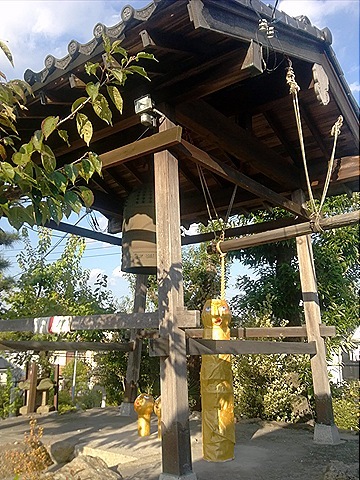 The temple was established in 1584 but was in another place: Kiyosu. Then it was replaced in Higashi-ku, Nagoya, in 1610 and kept being there until it was burnt down at the war in 1945. Then it was replaced again in this place in 1967. The temple has a long history and some old Buddha’s images made in 1300’s. 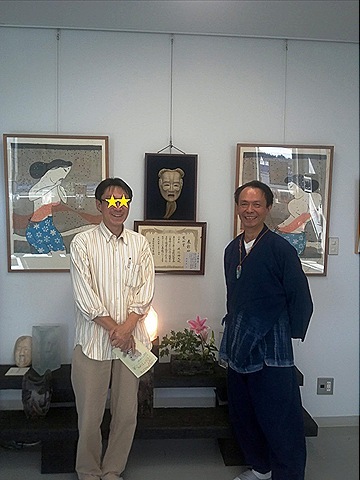 But the old-line temple has taken part in a contemporary art festival! That is interesting! 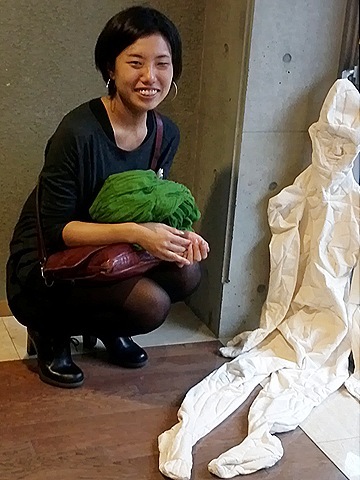 I was able to see lots of beautiful art and craft works, to meet some artists, and to hear from them many interesting stories through the event. I had a really wonderful time. Why don’t you come and see the event next year?